RUSH: This all happened yesterday on NPR, and it says here The Brian Lehrer Show. 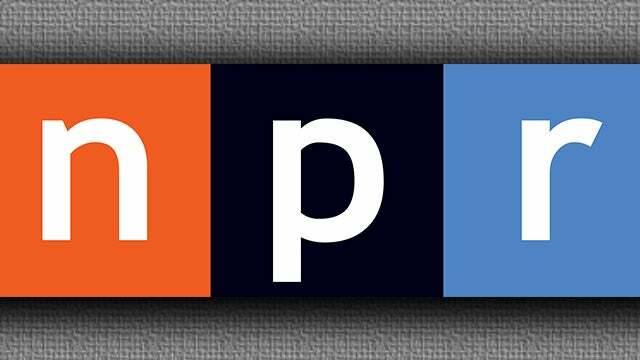 What they tried to… You know, NPR now and then will run segments translating me for their audience, because apparently common sense and well-articulated conservatism is like a foreign language to certain public broadcast viewers and listeners. So with Roseanne in the news — and by the way, I have some thoughts on Samantha C. that we will get to today. I didn’t want to lead off with Samantha C. I purposely wanted to move the discussion into the last hour, because Snerdley was almost in tears this morning when I walked in. I’ll tell you about that when we get there. Anyway, the Roseanne controversy happens, and, of course, the left wants to associate as many people with her since she’s getting beaten up and destroyed as they can. Remember, the left goes after people who are effective. RUSH: Your guiding light through times of trouble, confusion, murkiness and despair, Rush Limbaugh — a man whom thousands of women hope and pray their daughters will marry — in New York to WABC news/talk radio 770. Back to the phones. LEHRER: A few years later when Pat Schroeder was retiring from Congress, we got a good example of Limbaugh’s comfort with using derisive language about a woman in politics. 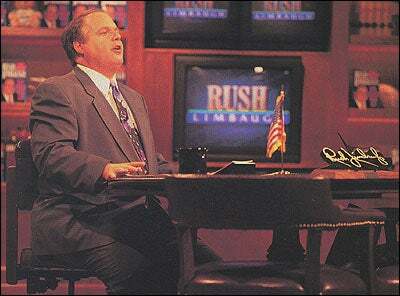 RUSH: Well, we’re back, ladies and gentlemen. … I have I guess a running feud with retiring Colorado congressperson Patsy Schroeder. Now, Patsy Schroeder went to the floor of the House of Representatives not long ago to start separating the fact that it’s “Women’s Herstory Month” [sic] and she divulged some facts which we played on this program — made some remarks we played — which contained errors. These were not actually facts, and so I corrected her as a public service. RUSH: Now, what is…? That is an example of my derisive language? What was derisive there? How did I deride Patsy Schroeder? Herstory? How…? He said “derisive language about a woman in politics.” Herstory? She came up with that term! The left was running around using that term. I thought it was because I was calling her “Patsy.” She never called herself Patsy. She called herself Pat. On the other hand, what in the world in there is derisive? Okay. So is your curiosity rising now? Okay. Now, get this next leap that he makes. LEHRER: So, Limbaugh called her “Patsy” Schroeder and all that on his short-lived [sic] TV show in the mid-nineties, at least he didn’t call her from Planet of the Apes. Maybe that wasn’t a side effect of Ambien then. But 1988 was also the year that the original Roseanne series went on the air. 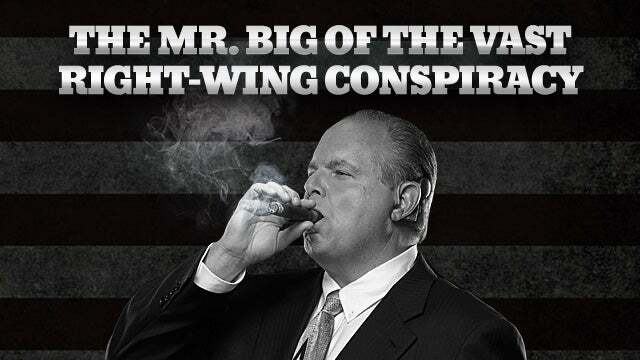 RUSH: Oh, my God, folks, it’s a conspiracy! My radio show starts in ’88, Roseanne went on the TV in ’88 — and therefore Roseanne and I are the same thing. So it was Patsy. Do you hear this? “Calling her Patsy and all on his short-lived TV show. At least he didn’t call her from Planet of the Apes”? So “Patsy” is derisive? I want to play for you what they missed. If they wanted to go after me going after Patsy, then let me set something up. Let me see what we have here. I made a speech once at GOPAC in 1995, which was Newt’s… He formed a political action committee when he became speaker of the House. They asked me to come make a speech. And I almost didn’t go because there was the 49ers and Cowboys on Sunday afternoon. So they grabbed a gigantic TV in the greenroom so I could watch the game before I went out and made the speech. Now, at the time, 1995, football season, the budget battle of 1995 is raging. This is the budget battle where Republicans are being accused of starving children. The school lunch cuts. You remember that? Okay. And the budget deficit, of course, was an instrumental figure. It was a part of the budget battle from 1995. And the Democrats are running around saying that the Republicans’ Draconian cuts were going to force the elderly to choose between eating dog food or getting their prescriptions filled. Do you remember that? Okay. And it was being bandied about and the Democrats were throwing this out for like two weeks. So when it came time for my GOPAC speech, I began by thanking them for having me. And I told them that I had been listening very carefully and paying very close attention to the budget battle and that I had decided the way I was gonna deal with this, and that was that I was going to buy my mother a new can opener so that she would be able to open dog food easier. That was going to be my contribution to the budget battle. Well, everybody appropriately laughs. I mean, the joke has more to it than that, but that’s the short version. They all laughed and so forth. But Patsy Schroeder’s staff saw it because C-SPAN televised it. Patsy Schroeder’s staff informed her of what I had said, and she then went to the floor of the House two days later — on November 13, 1995 — reacting to those comments I made in the speech at GOPAC. SCHROEDER: And they had the big kahuna of GOPAC come speak, none other than Rush Limbaugh himself, who stood there and said — to all these people who paid all this money to keep GOPAC rich — he was hailing the GOP budget! He said, according to the paper and according to the C-SPAN tape, he thought it was wonderful because it would starve the poor and it would drive Medicare recipients, including his mother, to eat dog food. “But not to worry, Mom,” he says, “I’m sending you a new can opener!” Wow. That tells you what today’s about. RUSH: She believed it! All the way back in 1995, they did not have a sense of humor. She bought it hook, line, and sinker! She goes to floor of the House! And then somebody got to her and told her that it was a joke and that I didn’t really mean it, and she dropped it like a hot potato. Never said another word about it. Now, I really wish the NPR people had found that, if they’re gonna do something equating me to Roseanne. (interruption) Well… (interruption) Oh, yeah, I’m getting there. I’m getting there. We’re not through here with stories involving me and Patsy Schroeder. Now, I think… When did she run for president? What year? Was I doing this show or was I…? (interruption) Okay, I was doing this show. I wasn’t still in Sacramento. Okay. So Patsy is running for president, Democrat nomination, and the day comes when she realizes she’s not gonna make it. So she’s gonna resign. At her resignation appearance, there was a man I had never seen, and it was her husband. I’d never seen the guy. I’d never seen him in public. She broke down and started crying as she was announcing she had to pull out of the race. And then she dissolved into his arms, into his shoulders and just lost it. She was just crying buckets. So I played the sound bite of all this on the radio and thought, “How embarrassing for the feminists.” Patsy was a feminist leader. She and Barbara Boxer and Feinstein, they were the feminist leaders of Congress in the House and the Senate. And she runs for president, and when she figures out she can’t do it she cries and dissolves to the arms of a man? “What a letdown,” I said. “I mean, this is devastating for the feminist movement. This video, these pictures, this is not… Feminists are not supposed to cry, and they’re certainly not supposed to cry in the arms and the shoulders of their husbands. They’re not even to be married. And they’re certainly not to seek comfort and protection and shelter from their husbands.” Well, you can imagine… I just wish NPR had found that too. SCHROEDER: The House of Representatives is the people’s body — and I will go back to her, and I hope you keep working with me to build a platform for progress that fits today and not yesterday. RUSH: She came out of her husband’s arms at that sound bite. The crying has happened before that.